There are many schools of belief in Islam today, but the differences between the Shi’ahs and the Sunnis are the most prominent. They go back all the way to 632 AD and the death of the Prophet Muhammud. The Sunnis say that Muhammud died without appointing a successor, but according to the Shi’ahs, Muhammud did appoint one, his cousin ‘Ali ibn Abi Talib, who was also his son-in-law. However, an election was held while ‘Ali was absent, still attending at the Prophet’s death bed, and it was Mohammud’s father-in-law, Abu Bakr, who was elected as the first Caliph. The Shi’ites did not recognise the election, and they have never recognised Abu Bakr or his two successors as legitimate Caliphs. Ali did eventually become Caliph, but only after the deaths of Abu Bakr and his two successors. Over the next 50 years, there was a series of assassinations and battles, an unruly and seemingly unholy power struggle, between the supporters of ‘Ali and his successors (the Shi’ites) and those of Abu Bakr and his successors, the party that became known as the Sunnis. One of the killings, the murder of Husayn, a son of ‘Ali, has become of particular significance for the Shi’ites. For them, it evokes powerful images of betrayal and of sacrifice of the chosen one for the sins of others. It has some parallels with the crucifixion of Christ for Christians. The direct line of descendants of ‘Ali became extinct when the Twelfth Imam disappeared, soon after he had inherited the title at the age of four. The Shi’ahs believe that one day he will reappear as the Mahdi v, and in the meantime the Ulema, a council of scholars, elects a Supreme Imam. The late Ayatollah Khomeni, for example, was elected in this manner. The Shi’ah religious hierarchy is a power pyramid, not all that dissimilar to that of the Roman Catholic Church. Shi’ahs believe that their Supreme Imam inherits some of the light of Muhammad, with special graces, miraculous powers and secret knowledge bestowed by God on him alone, and that he is an infallible interpreter of the law and tradition. The Imam is seen as an intermediary between God and man. This notion of having an intermediary between man and God has some parallels in the Roman Catholic Church, in which the saints are prayed to as intermediaries between man and God. In the Church of England, after Henry VIII had pushed through the Dissolution of the Monasteries, his son Edward VI attempted to abolish this intercessionary function of the saints. The Shi’ites depend on their priests, mujtahids or mullas, for spiritual authority. The mujtahids collect a tax from their followers, on behalf of the awaited Mahdi. This tax (a ‘fifth’) was, in his lifetime, the Prophet’s share of the spoils of war. Its collection today can amount to an enormous sum of money, which is a great source of the power of the mujtahids. The Shi’ahs set store by self-flagellation, intercession, martyrs, relics and pilgrimage, much as the Roman Catholics used to do. The shrine of Imam Reza at Mashad attracts some twenty million visitors a year. Sunni Islam, by contrast, more closely resembles the myriad independent churches of American Protestantism. Sunnis do not have a formal clergy: they have scholars and jurists who may advise but not give binding opinions. The Sunnis regard their Imams as holy men and as prayer leaders, but they do not believe that they are imbued with divine power or that they function as intermediaries between God and man. For them, each person must work for his own salvation, without help from any intermediary. Sunnis find the Shi’ites vilification of the first three Caliphs repellent, and they fiercely reject the concept of the Imam as a kind of ‘priest-king’ and the source of all temporal and spiritual authority. Both sides have strongly held beliefs and it is perhaps not surprising that friction and sometimes violence can occur between the two, as in Iraq and Pakistan today, although in other countries, such as Lebanon, there can be significant co-operation between them.12 The Sunnis are very much in the majority: throughout the world today, nine out of every ten Muslims are Sunnis. 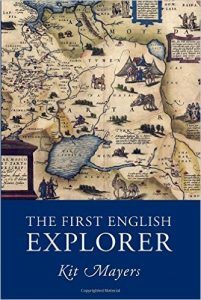 Extracted from Kit Mayers’ very excellent book ‘The First English Explorer‘ about the travels of Anthony Jenkinson, who travelled the orient in the time of the Tudors. Excellent read and on sale now.